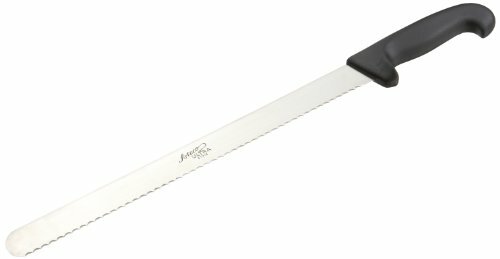 Ateco's Cake Knife has a 14-inch stainless steel blade and a plastic handle. It's dishwasher safe, shock resistant and sanitary. The serrated blade makes cutting cake easy and prevents compressing and misshaping cake. By Ateco. Since 1905, Ateco has supplied fine restaurants and bakeries with quality built, specialty baking tools. Ateco products are internationally renowned for their high quality. When you use Ateco products, you’re not only enjoying quality craftsmanship, you’re also enjoying quality design; the products are a result of over one hundred years and four generations of innovation and development. Professional 14" Stainless Steel Serrated Cake Knife - the Ultimate Cake Slicing Knife By Bakehouse Trading Co.